We are proud to supply a wide range of high-quality 3.00mm pitch power connectors to a variety of industries internationally. Leotronics are ISO-accredited suppliers of 3.00mm pitch power connectors, meeting your high-current and high-density requirements. We have a large stock of popular series numbers such as 5740, 5745 and 5746. Next day sample delivery and quick turnaround available for organisations in the UK and worldwide. 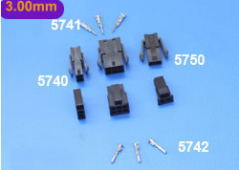 Proud to deliver high-quality, durable 3.00mm pitch power connectors worldwide.